I’ve never had a proper astrological reading before, have you? Not until yesterday at least when I booked a session with media astrologer, Sally Kirkman. Sally is a member of my Money-Making Magic Club and as we have been emailing one another for a while, I thought it was time to take a closer inspection of Sally at work. What a revelation! 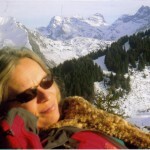 Firstly as you will see from her photo, Sally likes a ski-ing holiday. This was rather amusing when we Skyped one another ‘cos there’s me in my swimsuit liking hot places and Sally in her ski-ing gear loving to chill; an attraction of opposites? Where Sally and I did have a meeting of minds is that after minimal pleasantries Sally got straight down to business. She had prepared my chart in advance and had plenty to tell me about my sun, moon and stars. I learned why I love the moon and water so much, why my twin careers have been finance and communication, why I am a maverick who’s into New Agey stuff and Tech which at first glace might appear to some to be a contradiction. But not for me. Why I’m independent, what my drivers are, why I struggle with boundaries, why I’m restless, why I love to travel and why I want to retreat from the world and explore spirituality more. And then my sparky side, my dark side, why I attracted Svengali in 1984 and why there’s a risk of me doing that again in the not too distant future but this time forewarned is forearmed! And now I know too what’s coming up for me – even more letting go and clutter clearing, moving house, letting go of property and home, when I might feel I want to acquire a new home, when investments started in 2010/11 will mature in the first part of 2012 and my next career as a communicator. All this fitted in delightfully and co-incidentally (or so I thought) with my plans. But this isn’t a co-incidence, is it? Sally is very knowledgeable about her craft and her science. She isn’t fluffy at all, quite the reverse. She will tell you as much or as little as you want to know about planetary details and just stick to explaining what it all means if you are as new to this as I was. She followed up our consultation with more detail in email together with a list of well-aspected dates coming up in 2012 and a picture of my astrological chart itself plus some more interpretations. This was a luxurious hour; it always is when someone spends time on you and you alone and if this appeals to you, then I highly recommend a consultation with Sally. Right now she’s making herself available at a very affordable £85 per hour but I haven’t got my hands on her business yet! The value she delivers and her professionalism is worth way beyond that because of the content of the hour itself plus the time she put in preparing for the call and following up afterwards. We take our own expertise so lightly. Sally has been a leading name in media astrology in the UK since 1989 and written columns for the TV Times, the Daily Star and the Sunday Express. What I enjoy particularly about her website is that you can see your monthly stars, and read about Sally’s astrological thoughts about such fascinating topics as the ‘bromance’ that is Sherlock, and who will win Strictly Come Dancing.